The most important term for you to learn is: EV, which is Exposure Value. EV 11 is nice for an overcast day picture or with your subjects totally being in shade. There is a little rule for metering that you can take with you anywhere: the Sunny 16th rule: "On a sunny day set aperture to f/16 and shutter speed to the (reciprocal of the) ISO film speed or setting for a subject in direct sunlight." You might have noticed that the "reciprocal of the" part is in parenthesis. This is because we have certain values in photography that we do not explain more than it is necessary. E.g. 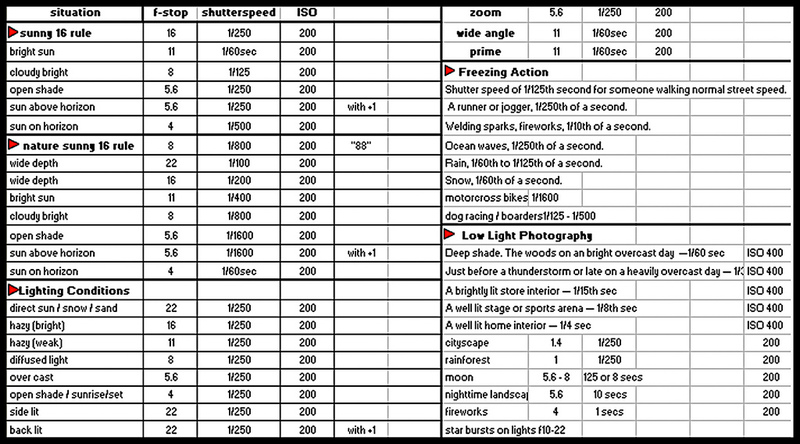 : if I say "i was shooting at 125" I definitely mean shutter speed, not ISO. ISO settings are round, e.g. : 100 or 200. If I say a small number (below ~30) I mean the aperture value, e.g. : 8, 16, 22. If I say a medium number (usually round) such as 40, 70 or 200, I will definitely mean the focal length. But do note that focal length and ISO setting do have some overlap, therefore they need to be expressed more clearly. EV comes in "full stops". One Full Stop is an exposure value determiner. E.g. : 11->12 is 1 stop up. Each scene you photograph has an appropriate EV. If you choose a camera setting that gives 1 less stop, it will be over-exposed. If you choose one that is 1 more stop, it will be under-exposed. Why? Because an EV 12 setting is (used) prepared for more light, therefore darkens the media, under-exposes it. Over-exposure means brighter, under-exposure means a darker/dimmer picture. If you have a lot of light on your picture you might want to dim-it just a tiny bit, to absolutely avoid burnouts. You can change the EV of a setup with 3 settings: Shutter speed, Aperture value, ISO. Shutter speed e.g. : 125 -> 250. ISO e.g. : 100 -> 200. Aperture e.g. : 8 -> 5.6. If you change one value up and another one down, the EV stays in place. E.g. : Aperture: 5.6 -> 8 and Shutter: 250 -> 125. ISO is untouched. IF you bring ISO down from 400 to 200, you will under-expose the picture because the ISO 200 requires more light, therefore you'll need to decrease your shutter speed or open your aperture by 1 stop: to A to 4 or S to 60. You can find a free EV-to-Settings calculator along with an EV list in the Tools section! There is one more thing you'll need to meter: camera movement. There is a simple rule for this to know when to use a tripod. If your shutter speed is smaller than your focal length's reciprocal then use a tripod to avoid camera shake. E.g. : if your focal length is 50mm and you need to shoot at 1/60th sec, you do not need a tripod. But if your shutter speed needs to be 1/30th sec, then a tripod is advised unless you have a very stable hand. Significantly going under half of your focal length's reverse will definitely result in camera shake: e.g. : 1/8th or 1/4th sec. This is important for zoom lenses where the focal length is variable. If you wish to zoom in (go above your shutter speed) then a tripod is advised. You might realize just now that if you zoomed in before with any camera, the shake effect became much stronger. There is a point when anti-shake features just don't work anymore.